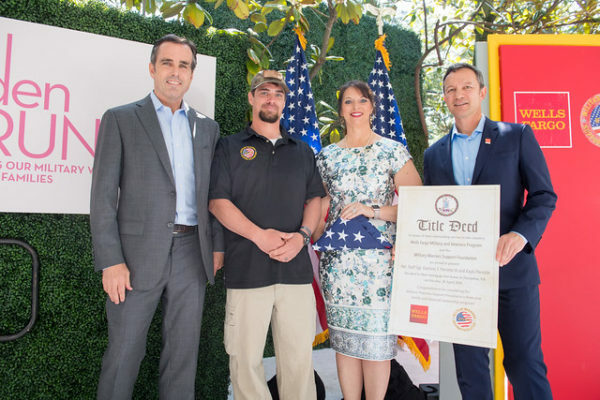 ABC News Reporter Bob Woodruff joins representatives from Wells Fargo and Military Warriors Support Foundation’s Homes4WoundedHeroes program to present a mortgage-free home to Staff Sergeant Dominic Perrotte at the 2018 WHC Garden Brunch. Photo courtesy of Haddad Media. The White House Correspondents’ Association Dinner on April 27th is just two weeks away, and with President Donald Trump poised to skip the gala for the third year in a row, all eyes are on the national media. After years of attacks on the press corps, the White House Correspondents’ Association (WHCA) is continuing its overhaul of the annual scholarship fundraising dinner to elevate the business of news and to highlight the critical role of journalists in protecting the First Amendment and bringing accountability to government. As part of the reset, the WHCA has invited author Ron Chernow to be the featured speaker at its annual dinner instead of going with a late-night TV host or comedian. Chernow has garnered wide acclaim for his biographies of business tycoons J.P. Morgan and John D. Rockefeller, and has written about Presidents and Founding Fathers, as well. His work “Washington: A Life” won the Pulitzer Prize for Biography, and his biography of Alexander Hamilton was turned into a hit Broadway musical by Lin-Manuel Miranda (Chernow served as historical consultant). The President’s re-election campaign announced that he will hold a campaign rally in Green Bay, Wisconsin at the Resch Center the night of the dinner. The 2019 White House Correspondents’ Dinner will take place on Saturday, April 27th, at the Washington Hilton.